Bridget Coila specializes in health, nutrition, pregnancy, pet and parenting topics. Her articles have appeared in Oxygen, American Fitness and on various websites. Coila has a Bachelor of Science in cell and molecular biology from the University of Cincinnati and more than 10 years of medical research experience. A clove of raw garlic, weighing about 1 g, is a punget dietary addition that can confer numerous health benefits to those who consume it. Available in bulbs containing between 4 and 20 cloves each, garlic can be purchased fresh or pre-chopped. Garlic is commonly used in cooking; however, raw garlic is more potent than garlic that has been cooked. According to the National Center for Complementary and Alternative Medicine, the most common uses of garlic for health include being used as a heart disease preventative and to lower blood cholesterol and blood pressure. Some people also use garlic to help prevent cancer, particularly colorectal and gastric cancers, to fight the common cold and as an antimicrobial agent. Raw garlic that has been cut or crushed and allowed to sit for about 10 minutes is more potent than garlic left uncut or garlic that has been cooked. When raw garlic is cut or crushed, certain beneficial compounds inside the garlic convert into a phytochemical called allicin, which is believed to be the source of many of garlic's potential health benefits. The University of Maryland Medical Center recommends 2 to 4 cloves of raw garlic per day when used as a health supplement. The garlic should be minced and can be added to pre-cooked dishes or eaten alone. Daily consumption may not be necessary, however. Some epidemiological studies, such as a 1999 report in the "Journal of Epidemiology" looking at rates of gastric cancer in relation to consumption of garlic and other allium vegetables, have found that consuming garlic three or more times a week may help prevent disease. 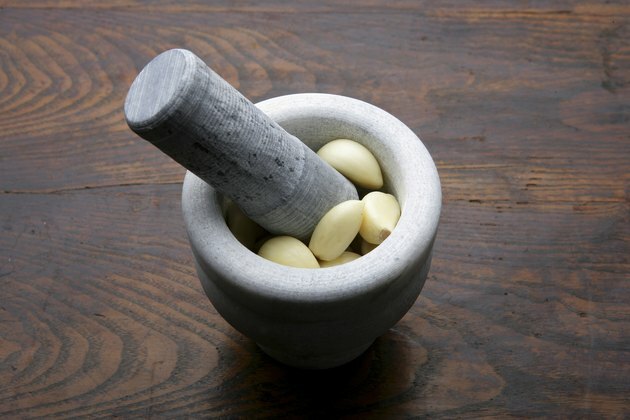 For people who cannot tolerate raw garlic, supplemental forms are available that might offer similar benefits. A total of 600 to 1,200 mg a day of aged garlic extract divided into a few doses throughout the day may provide protective health effects. If using a fluid extract, 4 mL daily is an appropriate dosage and 20 mL is an equivalent dose of garlic tincture. For most adults, raw garlic is well-tolerated. Common mild side effects after eating garlic include a strong body odor and bad breath. Some people develop nausea, heartburn or bloating after consuming garlic. Garlic acts as a blood thinner, so people anticipating surgery, dental work or childbirth should consult a doctor before using large amounts of garlic. Garlic may interact with some drugs, including HIV medication and the blood-thinning drug warfarin. "Journal of Epidemiology": Comparative study of lifestyles of residents in high and low risk areas for gastric cancer in Jiangsu Province, China; with special reference to allium vegetables. What Are the Side Effects of Garlic Tablets? How Many Cloves of Garlic Can You Eat in a Day? What Are the Health Benefits of Raw Garlic Vs. Cooked Garlic? Can You Substitute Garlic Tablets for Daily Garlic?